We got up, got dressed and headed out to breakfast. After which we were just in time for the zoo to open its doors. Being practically the only people off to the zoo at 9am we had the run of the place and all the animals were out and about. We watched the seals swim around and remarked on how similar they look to our rather large brown cat when he's had a bath. As for my favourite portrait from last week it would have to be little Lucian only 7 days old and his beautiful big sister Biet. Super cute :) Even to this day visiting zoos and aquariums are so exciting. I'd like to visit one as a child again - just to experience how new and amazing everything is! 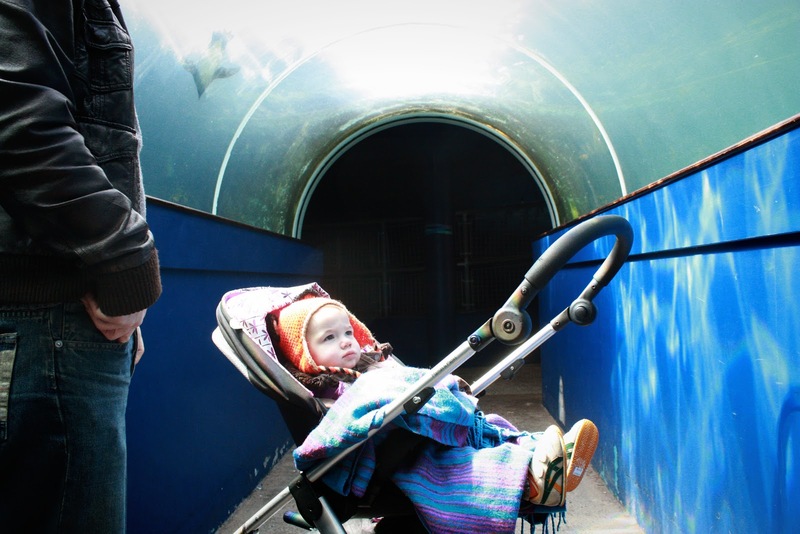 The seals and penguins are our favourite bit of the zoo too! Love the framing on this shot. Hi! Great photo! Just dropping by from your link on Che and Fidel. I love getting out and about early with my kids, its so much more peaceful without the crowds. PS, I like your idea of setting up a Pinterest board for all the 52 project photos. I think that would be lovely. I also am not sure how that is done, but have read you can set up a group board somehow. I'm pretty new to Pinterest, and I've just started following your lovely pins. Take care. Awesome capture... love the colours. I really loved this image. The colours, and the light. It was one of my faves featured this week.